Building your blog takes time. In most cases it also takes actual writing skills and dedication to your craft to start pulling in traffic. In the meantime however, there are ways to get your content in front of viewers to use as a platform for promoting yourself and/or your website. Think of it this way: imagine you had a website and you want to build your reputation rather fast. You come across a website that allows contributions from outside writers and you submit an article. This article is now accessible on an already existing website with a large traffic flow. When people read your article, they see your name (and profile). This information then leads to your own blog or website and instantly you become known in the blogosphere! Ok, so maybe it’s not as easy as it sounds! But the point is, if you know your content is good and you want to get it in front of people relatively easy, this is one sure way to do it. Check out my Associated Content profile to see how people will view you. 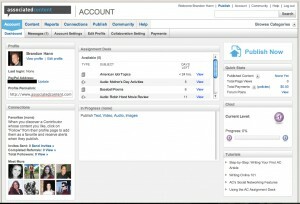 AC is touted as “The people’s media company” and it is essentially a collection of over 2 million articles written on almost every topic you can think of. The best part is that these articles are written by people like you! That’s right. You are a contributor to a growing collection of content and at the same time, building a name for yourself. To sign up, you simply need to head on over to the AssociatedContent signup page and fill out the required information. Afterward, you’ll be sent a verification email. 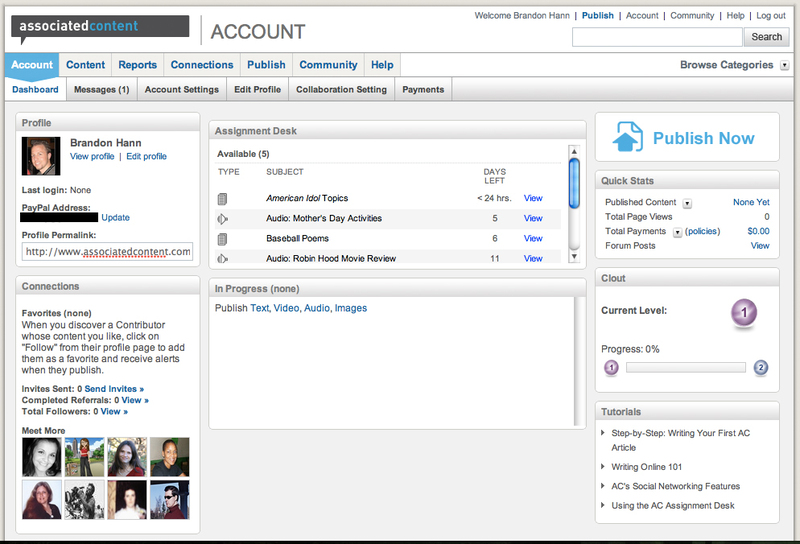 Once verified, you’ll be taken into your account and you can start publishing content right away! Pick the format you want (Text, Video, Audio, Images). Pick the topic that the content is about. Answer some copyright questions about how you want your work distributed. Within your dashboard, you can also see a number of previously established assignments that you can choose to fulfill if you’d like. Don’t worry about writer’s block either! Associated Content will provide you with ideas if you’re stuck. Performance Payments are payments based on the traffic to your content and allow you to earn unlimited cash from your text, video, slideshow and audio submissions long after they have been published. You earn money for every one thousand page views your content generates (PPM™ rate). The baseline PPM™ rate is currently $1.50 – meaning if you generate 30,000 page views, you’re paid $45.00 in Performance Payments. As your library of content grows and your total page views accumulate, your Clout level increases. When you reach Clout 7 and beyond, your PPM™ rate will gradually increase up to a maximum of $2.00 per thousand page views. Check out the quick stats (under total payments) on your Account dashboard to see your current estimated earnings, and track your page view statistics per piece of content from the Content page. Click here to read more about the Clout system. Another payout option is Upfront Payment. Your content is subjected to a review by the site editors and based on its originality and quality, you will receive an offer. At this point, you can choose to accept the offer or not. There are stricter rules for submitting this kind of content. There is a LARGE amount of information you may want to peruse through before you get started, but if you’re interested in becoming a freelance writer and/or build your reputation along the way, you will love this site. For more information, please see AssociatedContent’s FAQ section. To sign up now, go to AssociatedContent.com!